Odisha, a state in Eastern India, has some unique festivals like the Kumar Purnima, being celebrated today, on the last day of the Ashwin month. 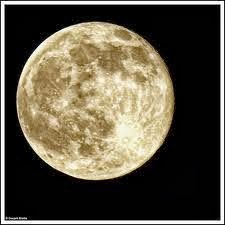 Kumar- means Youth and Purnima- means full moon night. Young unmarried and newly-wed girls seek the Sun God and Moon God’s blessings. These days, young men also celebrate the same. In the morning, young girls bathe & wear new garments and make food-offerings to the Sun God. They observe fast. They rejoice, sing and dance and play a special kind of game known as Puchi. In the evening, they put Liya (an item like puffed rice/poha) along with cowrie-shells for the Moon God amidst 'hulu-huli' (sounds made/done during auspicious occasions). My Mom insisted on seeing the Moon God first, as soon as He appears in the sky on Kumar Purnima! The early birds get His blessings first! Girls offer food to the Moon God and then have the same after completing the rituals. The Kumar Purnima prasad is so yummy! This special dish/food- item is prepared out of Liya, Bananas, cottage cheese (called Chhena), grated Coconut, Black Pepper, Honey/Jaggery/Sugar etc and this is offered to the full moon in the evening. Many pithas (sweet-preparations) are made at home. Floors of homes are decorated with jhoti (design patterns made from rice-paste). The full moon (Purnima) also marks the beginning of the 11-day Gajalaxmi Puja that is celebrated across the state. Today is the birthday of GajaLaxmi, the Goddess of Wealth. The Kumar Purnima festival observes the birthday of Lord Kartikeswara, the son of Lord Shiva & Goddess Parvati. It is believed that unmarried girls pray and get a handsome and ideal life-partner/husband like Lord Kartikeya, if they observe the rituals! Lord Kartikeya is one of the most handsome Gods in our mythology. ‘Gaja’ means ‘Elephant’ in Odia. People worship GajaLakshmi in homes and play card-games and dice games in the evening till late-night, especially in Southern Odisha. Gambling is prevalent. It is believed that whoever doesn’t play card-games will be reborn as a monkey in her/his next birth. Beautifully decorated GajaLakshmi Pandals are set up across the state. The festival is very popular. You must plan to travel to Odisha during this time and see the wonderful Pandals. I love this special festival that is celebrated in Odisha. Looking forward to play some card-games today and have lots of the yummy prasad on Kumar Purnima! IndiSpire#88- Share any special fact or info about your native place or any place that you have loved. Happy celebrations to you Anita. Yes, Indrani! Aware of the Lokhi Pujo in WB. 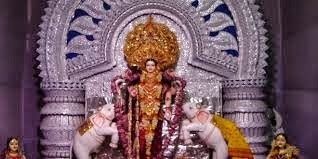 It's GajaLakshmi Puja in Odisha! Thanks for the wishes and same to you! Celebration time! There are many festivals celebrated with diff names across India on same day, however I dont find any celebrated on the occasion of birth day of lord Kartikeshwara. Nice post. Glad you liked it, Paresh. That's the beauty of incredible India! Yes, though the festival is for Lord Kartikeya's b'day, the Sun and Moon are worshipped! I have never heard of this!! Makes me proud of our cultural heritage. so varied! Thanks for sharing this post Anita. Lu -Lu sound done in special days in Tamil nadu and Bengal side too.Any way good post. Great and informative post . This festival is known as Sharad poornima in northern India . In 365 days a year, more than 365 festivals are observed in all over India. And interestingly people from all religion celebrate together no matter which religion's festival it may be. Such diversity you can only find in India. That's why I'm proud of my country. Festival are the important part of our life. They give us the moments of togetherness and happiness. Apart from our mundane work schedule, we need something that can rejuvenate us. These festivals do this part.